FILE PHOTO: Russian Foreign Minister Sergei Lavrov speaks during a joint news conference with French Foreign Minister Jean-Yves Le Drian following their meeting in Moscow, Russia June 20, 2017. MOSCOW - Russian Foreign Minister Sergei Lavrov urged world powers on Friday to get behind a joint Russian-Chinese roadmap for settling the crisis over North Korea’s weapons program. Speaking at a conference on non-proliferation in Moscow, Lavrov said that the break-up of a deal on Iran’s nuclear program would send an alarming message about international security mechanisms, and could impact the situation on the Korean peninsula. Russian Foreign Minister Sergei Lavrov urged world powers on Friday to get behind a joint Russian-Chinese roadmap for settling the crisis over North Korea’s weapons program. 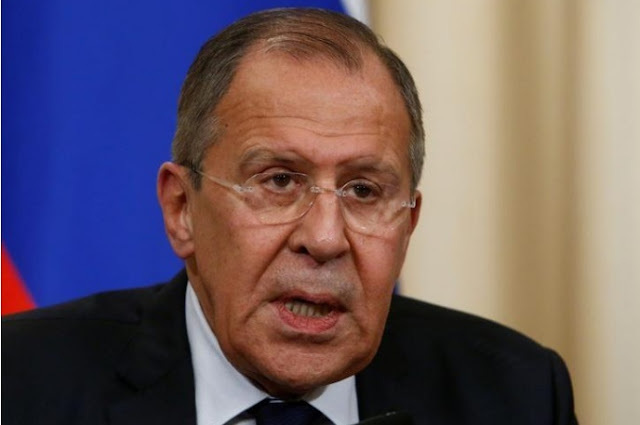 Speaking at a conference on non-proliferation in Moscow, Lavrov said that the break-up of a deal on Iran’s nuclear program would send an alarming message about international security mechanisms, and could impact the situation on the Korean peninsula.